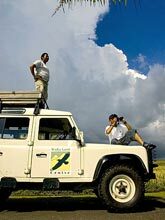 Bali Activity Maximum 7 people per car, visit traditional villages, pass through beautiful scenery of rice terrace and go deep into the lush forest. After sightseeing at full of tropical fruits garden and stone-cutting village enjoy Balinese lunch at a restaurant on the slope of Mount Batukau. You can also try wine and Bali coffee. * Waka Land Cruise tour sharing with other guests. Please contact us for a private charter. 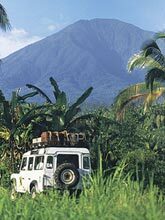 Hotel Transfer, Land Rover Touring, Soft Drink & Mineral Water, Coffee, Tea, Snack, Balinese Lunch, Wine or Beer at Lunch Time and Insurance. 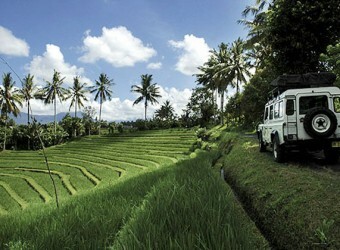 * Free Pick up Service：Nusa Dua, Jimbaran, Kuta, Seminyak, Sanur and Ubud area by Waka Land Cruise. * Max.7 people per car.Tour sharing with other guests. 8：30～8：45 Hotel pick up by Land Rover of Waka Land Cruise. Please wait at hotel lobby. ・The villagers cut the stones from the cliff using traditional methods handed down for centuries. 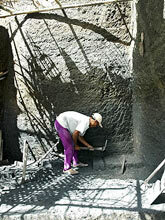 ・Stone blocks weight around 5 kilograms each used to build shrine and temple in Bali. 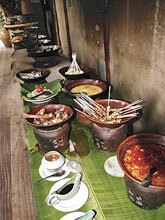 ・Visit a traditional Balinese house of a farmer family. ・Take a walk in the garden. You can see banana, mango, rambutan, salak (snake fruit), jack fruit and other seasonal fruits, and also vanilla, tapioca, clove, cocoa and other crops. 13：00～14：30 Arrive at rain forest camp. 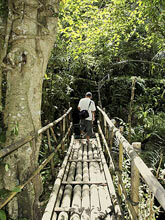 ・The camp is situated at the area above Jati Luwih rice terrace, on the slope of Mount Batukau at 900m above sea level. 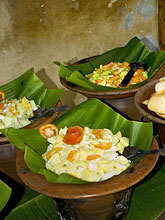 ・Enjoy Balinese lunch at the restaurant including wine. 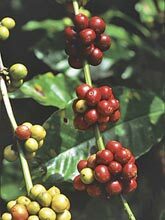 You can also try Bali mountain coffee. 15：00～15：30 Arrive at hot spring in Banjar Belulang. ・Hot spring at a temperature of about 30 degrees that is used by local people. ・Enjoy the stunning view of rice terrace. 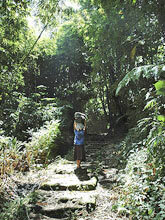 ・You can also see traditional Balinese water irrigation system. How many people can join the tour per car? Is it possible to do the activity when raining? Yes. We can do the activity when raining. Depart from hotel at about 8.30am ～ Back to hotel at about 5pm. About 8 hours. Pick up service by Waka Land Cruise for Nusa Dua, Jimbaran, Kuta, Seminyak, Sanur and Ubud area. 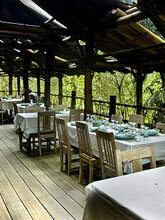 Lunch at a restaurant in rain forest camp surrounded by deep forest of Mount Batukau. ※Safety box is not available. Do not bring valuables. ※Rates and schedule are subject to change without prior notice. ※Insurance doesn’t cover your belongings. Village tour is a very valuable experience. Lunch was delicious, but the restaurant was a little dirty. My friend seemed that has less appetite. I ate a lot.